Testing the Apple Pippin: Part 2. A truly unique experienced that will be shared by too few. Note: You can find part 1 of this story here. The best part about collecting video games is that every collection is unique. Whether you have a small collection around 500 games, close to 4000 like I do, or a huge collection of 10,000 games or more. Every collection has at least one item that would sit rather high on another collectors wish list. Whether it’s a copy of ChronoTrigger or a highly sought after Pokemon game, there will always be another gamer out there looking at your collection thinking “I need that, and that, and OH, that’s nice!” For the serious collector, if you spend enough time and effort searching for your next great gaming experience, you will stumble upon a gaming ‘Holy Grail’ sooner or later. The Apple Pippin @World is one of those Holy Grail gaming consoles that eludes many serious game collectors. Produced in low numbers by Bandai and Apple in 1996, less than 5000 are suspected to exist, even fewer complete and boxed. 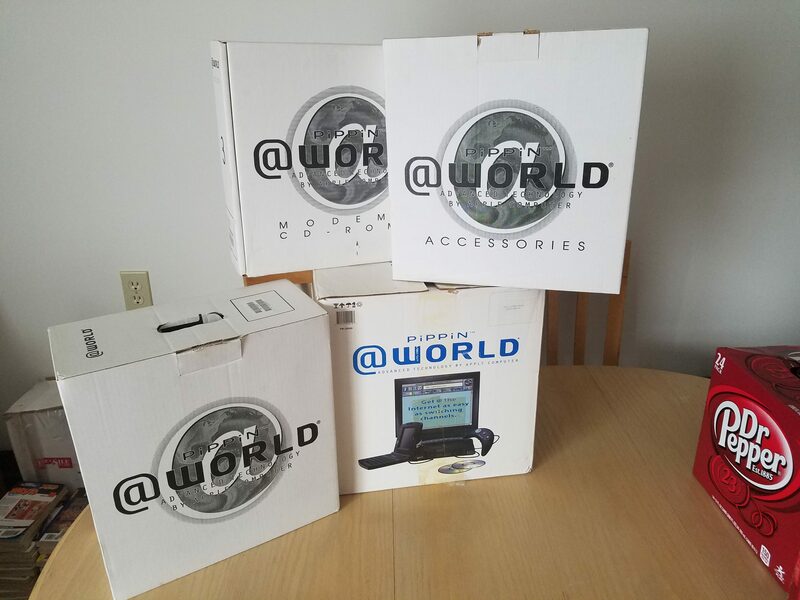 I believe I found my @World somewhere around 2006 while browsing Ebay, dreaming of all the items I would buy when I got rich. I happened to stumble upon a listing for an iMac for roughly $115 plus $20 for shipping. I couldn’t believe it! Some fool had listed an Apple Pippin @World, one of the most rare gaming consoles in existence, as an iMac. I envied the gamer who stumbled upon this piece of history knowing I could not afford the item, but this thought wouldn’t last long. I ended up buying the system anyway. When the Pippin arrived in the mail, I checked that the console powered up, ran a few cds on it to verify the laser was good, and packed everything away. I wouldn’t touch this console again for another 10 years. Finding an @World is rare. Finding one with all of the packaging? Unreal. Fast forward to the beginning of August, 2016. For the past 2 years I have been on a mission to find a black label copy of every original Xbox game released in the United States. A mission which has introduced me to many gamers throughout the region, as well as some of the really big time collectors near by. One of these collectors was intrigued to find out that I had an Apple Pippin in my collection. Though I’ve known him for a while now, our schedules never seemed to line up in a way that would allow us to participate in each others game nights. Until this past weekend. Although I didn’t have any official software for the system I was able to burn quite a few iso’s from several popular Japanese titles, as well as a copy of the most sought after title, Super Marathon. I expected more gamers to show up, especially if they were aware I was bringing a console as rare as the @World. Unfortunately it was just me, the host, and his two cats & two dogs. We started the game night outside in his garage where the host and a mutual friend were closing up a garage sale they had during the day. 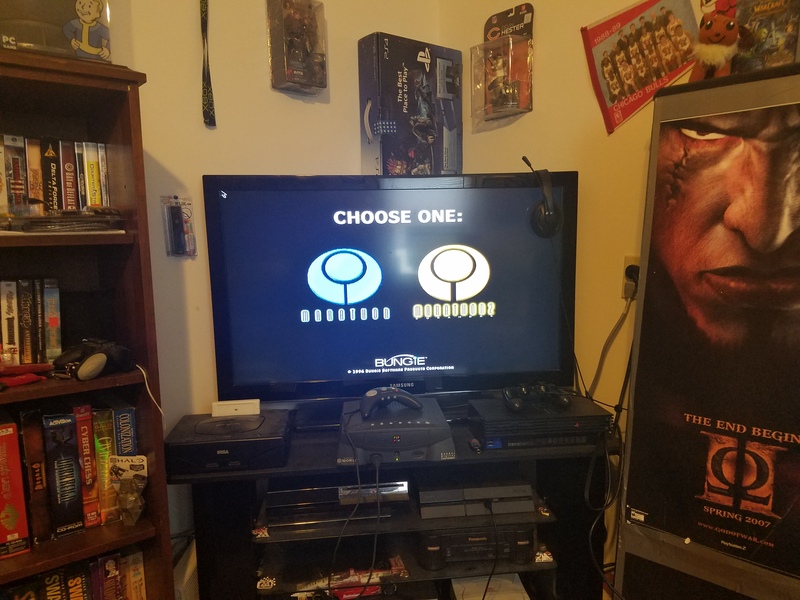 I brought out the console before our mutual friend had to leave so that he could at least say he had seen one in person, but the mosquitoes started to get bothersome so we moved everything inside and went down to the game room. Before we hooked up the Pippin, I had to check out his collection. I was now that guy looking at everything on the shelf pointing out the items I needed. He has me beat by about 30 consoles and 1000 games. It’s not just greater quantity, but quality titles as well. He owns at least 20-30 games of greater value than my most prized possession, my sealed copy of Conkers Bad Fur Day on N64. The rarest that I saw that night, a copy of Super Air Zonk for the Turbo Grafx Super CD system, valued well over $1000 for a single disc. But this is why I love seeing other peoples collections. He has some of the games that many consider a Holy Grail, games that are too expensive for my taste, where I have a few of the game consoles that are considered a Holy Grail. Shockwave by Electronic Arts running on a 3DO console. No screens of the Pippin version are available at this time. So we finally got around to unboxing the console and hooking it up to his TV. Since the console is ultra rare, I decided that I would only pull out the main unit and controller, leaving the keyboard accessory packed snugly in it’s box. As I hooked the system up, we spent a few minutes talking about the design of the console itself. The machine is fairly heavy and was aesthetically pleasing. Unfortunately this did not translate to the controller. At this point I wasn’t sure what kind of games he liked, but I was sure I wanted to save Super Marathon for last. I offered the choice between several Mobile Suit Gundam games or Shockwave. Since Shockwave was also released on the 3DO, we decided to check that out since it would allow us to compare the two versions and give us a solid idea of how this console stacked up against the rest. It took a little while to get used to the controller, there is only a d-pad to control movement and it is incredibly sensitive. Slight taps can turn your ship rather quickly and often made it hard to target enemies. 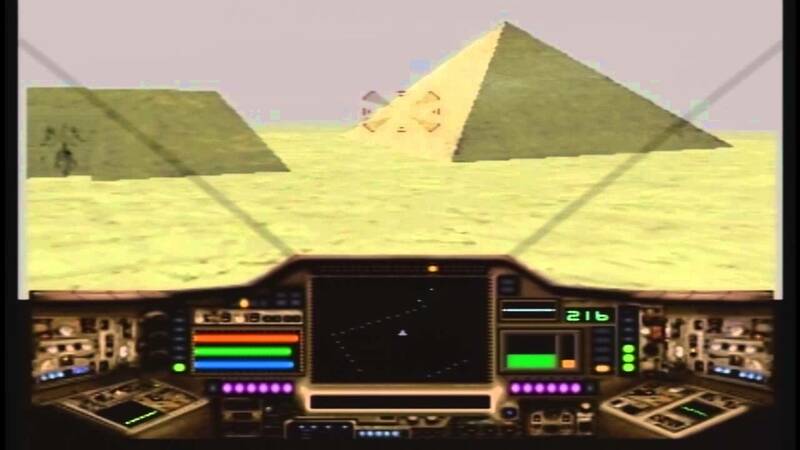 This wasn’t much of a problem with the stationary enemies, but some of the flying enemies later on were nearly impossible to hit without flying in circles for a minute or two. We both spent about 15-30 minutes playing Shockwave, neither of us making it past the 3rd level. We both agreed that the controller wasn’t as terrible as we had thought, but wasn’t good either. Since the game was in Japanese neither of us really knew what we were supposed to do, and there weren’t any clear instructions on how to play the game, or which button performed what action. After some discussion about the potential of the system despite the limitations of the controller, it was time to check out the systems only Killer App. Super Marathon. A shot of my Apple Pippin @World running Super Marathon while testing out the console before the game night. Whether you are a retro gamer or a modern gamer, chances are high you know of Bungie. Bungie have created several great franchises over the years, including Myth, Marathon, Halo, and most recently, Destiny. What you probably don’t know is that Bungies first console game was this rare gem released only for the Apple Pippin. Super Marathon is a bundle that contains the original Marathon plus its sequel, Marathon 2: Durandal. For the most part, these games are pure ports of the original Mac versions with some additional networking options added in. We tried to play this game using the controller, but the experience was frustrating and felt like it was being constrained by the controller itself. Too many typical FPS commands simply were not mapped to the controller, and those that were did not feel like they were placed correctly. But we weren’t ready to give up just yet, there had to be more to this game. Then it dawned on us. What if you could use the keyboard to control the game? After all, it is a computer game, surely it allowed you to use the WASD keys to control something in the game. It turns out we were right. This game was meant to be played with the keyboard accessory instead of the controller. Once we got used to using a more traditional keyboard control scheme(minus the mouse), the game became much easier. Though it was still a challenge, it was not because we were having trouble with the controls. After the change, we were finally able to complete the first level of the game. Marathon was as good as advertised, but left us both feeling a bit sad. It took a while but we were now able to see the potential of the @World. Apple had created a monster of a gaming console. But a lackluster controller, poor games lineup, high cost and abysmal marketing doomed the console from the start. What could have been one of the great consoles of our time ended a complete disaster. We ended the night the same way it began, talking about some of the great finds we have had over the years. Both of us having had similar stories, sometimes walking away with stacks of rare Playstation 1 games for $50 total. Both of us had a stack of Turbo Grafx 16 games that we picked up at the same store around the same time, maybe even donated by the same person. He would tell a story about finding a $500 game for under $10 at a thrift store, I’d follow it with a similar story of my own. Like two old friends reliving the years since they’d last hung out. As the event wrapped up, we both had the same feeling. We had just taken part in a gaming session that few will ever get to have, and wonder what the system would have been capable of with proper support. While it makes us sad that the console did not get a chance to live up to it’s potential. We both came away excited to share our story of the time we played Super Marathon on a Pippin. A feat we estimate only a couple hundred have ever experienced. A rare club to be a part of for sure.